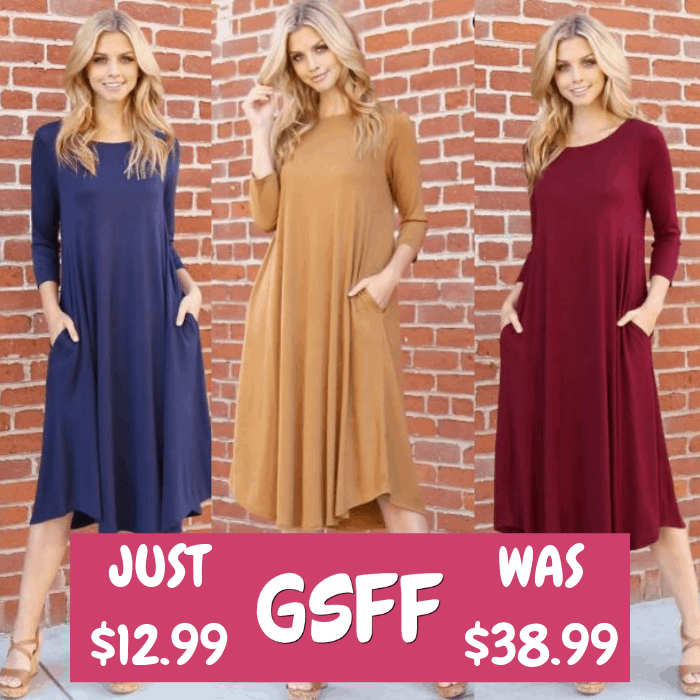 Swing Pocket Dress Just $12.99! Down From $39! You are here: Home / Great Deals / Swing Pocket Dress Just $12.99! Down From $39! Until December 19 only! Right now at Jane, you can score this Swing Pocket Dress for just $12.99 down from $38.99! Shipping is $3.99 for the first item and $1.99 for each additional item. Add playful, fall vibes to your wardrobe with this 3/4 sleeve dress that features a round neckline, on-seam pockets and a below-the-knee length hem. Wear it with sandals on warm days or with boots and a denim jacket when it’s chilly. This dress is versatile and a must-have in your closet.